Think you know whose going to win this week at the WCWS? 8 Teams arrive in OKC but only one leaves crowned the National Champion. Find out what it takes to be THAT team! Way back in January, 290 Division I softball teams started out the season with one goal – to make it to Oklahoma City and win the Women’s College World Series! For 282 of those teams their season is over but that dream is still alive for the remaining 8. These 8 teams will arrive in OKC after having played a very long season and after battling through Regionals and Super Regionals. Some of those 8 have been on the road for almost 3 weeks and all of them are tired and banged up. But this is what they’ve all worked for and now the chance of a lifetime is before them. So what will it take to come out victorious? As 2009 National Player of the Year, Danielle Lawrie said in her quote – it’s going to take a lot of fighting, pushing, scratching, clawing, sweating, kicking and screaming – and that’s from someone who most people consider the best pitcher in college softball! Imagine what all the others think it will take? What Danielle’s quote tells me is that she and all of her Huskie teammates are not assuming they will win. In fact, the only thing they are assuming is that they will outfight and outlast anyone they play. It’s kind of like Survivor on the ballfield; outwit, outlast, outplay. 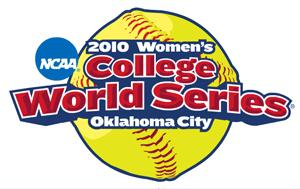 So, want to know who I think will win the 2010 Women’s College World Series? I’m no Miss Cleo so I can’t predict the future and tell you exactly which team will win this year’s WCWS, but I can tell you what that team is going to do in order to win it. Winners don’t whine and complain, they simply and quickly adjust! We saw many teams’ in Super Regionals who couldn’t make the simple defensive plays. Errors let your opponents set baserunners, extend innings, and put more pressure on your own team. Capitalize Better – The winner won’t be the team that gets the most runners into scoring position, it will be the team that scores the most runs! Capitalizing on your own opportunities and on your opponents mistakes is what champions do. You don’t need the most opportunities you simply need to capitalize on more than your opponent! Devour Better – I love the word “devour” as it is so much more descriptive than beat, or win. Devour means that there is nothing left when you are finished, and while that can have a rather graphic connotation it’s what champions do to their opponents. They go after the win and don’t want their opponents to have anything left when it’s over. This week’s winner will devour their opponents, and while that might not mean they win by huge margins, it means that they devour their opponent’s spirit to win! Bounce Back Better – It’s rare that a team wins the WCWS undefeated so whoever does win will ultimately have to bounce back from a defeat, and bounce back better than anyone else. Often times that means you’ve got 30 minutes to bounce back as a loss at the wrong time can mean your team plays back-to-back games. While I don’t know which team will win I do know they will bounce back better than the other 7 teams. Luck Out Better – Lady luck matters as sometimes the ball that hits the top of the outfield fence bounces over that fence and sometimes it stays in the park. What determines this, who knows but Luck sure plays a part in the outcome. But, as the saying goes, the harder I work the luckier I get and you can bet that all 8 of these teams have worked hard for their luck this season! Star Power Better – All 8 of these teams have stars but not all the stars will shine this week. The team that wins will no doubt get the best performances from their best players. Real stars shine when the lights sre brightest on them! Step Up Better – Every year somebody is called upon to come in and make a play at a critical point in the game. That player might be a freshman who is new to the WCWS environment or a Sr. who gets little playing time, but you can bet that the winning team will get a clutch performance from someone who has spent most of the season watching the game instead of playing it! Do you think you know who will win this year’s NCAA National Championship? Follow along either by watching on ESPN or the internet as history is ready to be made and the one thing we know for sure – someone will be crowned National Champion! I don’t know who it will be, but you know I have to root for HAWAII!!! 😀 They are, however, among some VERY good company. No matter who wins, one thing is certain (besides what Cindy already mentioned), there will be some GREAT softball going on & I’m going to enjoy it! All year long everyone was talking SEC and how strong they are. I follow sports in general religiously, but softball is at the top. The Pac 10 is the strongest conference around. They have the most championships, and the had the most teams in the Super Regional’s. The softball will be great regardless of who wins. I am a UCLA fan and always will be. If the don’t win, I want a Pac 10 team to win to continue the dominance. Enjoy everyone, it will be fun!!! Better check those World Series bats. The way the ball was flying off them in the regionals and super regionals either the pitching is falling off from past years or the bats have titanium tendencies. Evaluating the pitchers, it’s evident that the forward drag styles don’t seem to produce pitchers that can really put enough spin on the ball to really make it move sharply as there are a lot of pitches traveling more linear pathways to the plate making them easier to track. Cindy, I enjoyed listening to you on TV this past weekend. Some very exciting games, and I guess it doesn’t get any more thrilling than the Hawai’i comeback. By the way, immediately after the OF’er let that foul ball drop in the 2nd inning against Georgia I shouted at the TV, “NO”!! And right before the next pitch I heard you say that the ball has to be caught. And sure enough the very next pitch was parked! Maybe a good play in the 7th inning, not a smart play at all in the 2nd. Hope to hear you this next week in Oklahoma City! Thanks Scott! I really enjoy broadcasting games and we sure had some exciting ones this past weekend! I’m with you on the OF ball that was allowed to drop – too good of a hitter up in too big of a situation. Gotta take outs when they’re handed to you, particularly from their BEST hitters! This should be a Great week of softball as new teams are showing they can play too! Cindy, should the girl from Hawaii, that hit the home run been called out, for stepping backwards toward home plate after she started down to first base….if you watch the replays, she came out of the box, went down the line, stopped and took a step back to see if the ball was going to go foul (the home plate umpire was looking down the foul line, did not see her step back…..if you hit a ball on the infield and someone comes over to tag you and you take a step back, you are immediately out, the ball is dead and you cannot advance a runner…..to me once she stepped back she should have been called out cause the ball had not left the ball park at that time, as she did not go very far before she stopped and took the step back????? ?….you make the call and watch the tape!!!!!!…. Ron, You’ve brought up a point that I’ve heard quite a lot about now – and that’s whether or not the Hawaii hitter (Jenna Rodriguez) that hit the walk-off home run against Alabama should be called out for stepping backwards to watch and make sure her hit stayed fair. As coaches, one of the skills that we need to have mastered is our knowledge of the playing rules. This is a great opportunity to better learn this particular rule – when exactly is the batter-runner out for stepping back toward homeplate. 12.4.10 When she runs the bases in reverse order to confuse opponents or to make a travesty of the game. EFFECT—The ball is dead. Each runner must return to the base legally occupied at the time of the pitch. 12.4.11 When she steps back toward home plate to avoid or delay a tag by a fielder. legally touched at the time of the pitch. This batter-runner did not try to confuse Alabama or make a travesty of the game (thus NOT violating rule 12.4.10), and she did not step back toward home plate to avoid or delay a tag by Bama’s fielder (thus NOT violating rule 12.4.11). So clearly, the NCAA umpires made the correct call by allowing her step-back to go un-penalized and giving her a walk-off, game and series winning home run. Well done umpires! And . . . WELL DONE CINDY!!! About 2 seconds after the the walk-off shot heard all over Alabama – and for that matter around the entire softball world – the “She stepped backwards” posts started. So glad to see someone with knowledge and the voice that you have is willing to immediately squelch all the conspiracy posts. Looking forward to the 2010 WCWS. This is going to be exciting!